Something to hold my cups please. I was on my way to work the other day in my Nissan Frontier with my big glass of water that I usually bring with me. 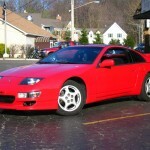 I was thinking that in a few days maybe I’ll be driving my next 300ZX to work and then I remembered something about my former 300… there are no cup-holders! I used to just take out the ashtray and put a cup there but that gets in the way of shifting, especially if you are sporting a big gulp or the like. I have started doing a little research on what aftermarket products are available these days to solve this “problem” and was disappointed to see that there really aren’t that many. 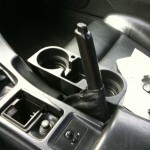 There is one that I saw on Courtesyparts.com that you place where the ashtray is and it allows for 2 cups. I would think that one would get in the way as well and possibly not secure the cups very well while turning sharply at a decent speed. I also saw a craigslist listing where this gal had a more practical looking cup holder that fits on the passenger side near the parking brake. I asked her what kind of cup holder it was and she said she got it at Autozone. It turns out that one just slides between the passenger seat and the console so I’m not real sure how secure it is either but it’s cheap enough that I’ll probably buy one just to use for now and see how it works out. 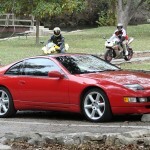 I searched on Google to try and see if maybe someone had done some modifications to the console storage area or lid but couldn’t find any for the Z32; I did see several for the 240SX. 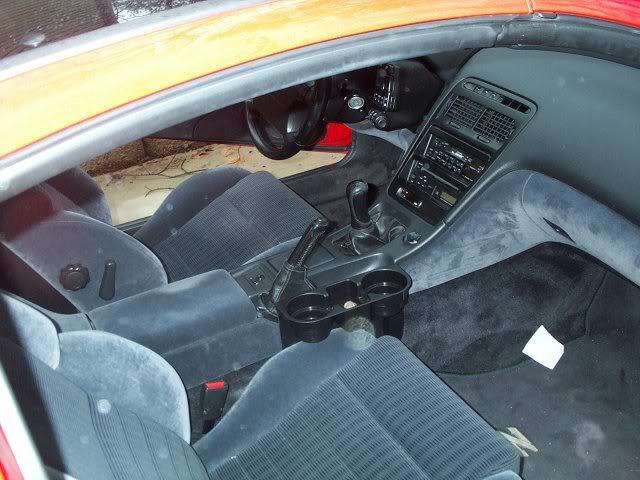 It has me thinking that maybe I can figure out a way to fabricate some sort of practical cup-holder for my 300 that doesn’t look extremely out of place and if it works well then maybe that’s the thing that makes me rich and famous! OK, maybe I’m taking a step outside of reality there but I do plan to try and make something that will hold my cups for me while I’m cruising down the highway. 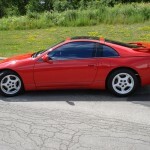 2010-07-30 UPDATE: The first thing that I did after I purchased my 300ZX was to buy gas for the long trip back and then I headed to Autozone to buy the above mentioned cup-holder. 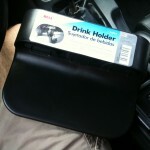 It came in very handy on the trip back to hold my drinks, change, cell phone, etc. 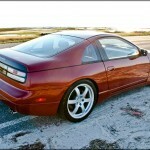 Lately I have been feeling like maybe my search for the right 300ZX is coming to an end. I think I have reached a deal on the white one in Kentucky and will most likely be flying out there next week to drive it back unless something falls through. With that being possibly done I have started to focus some of my thoughts on what the first upgrade that I will do is. 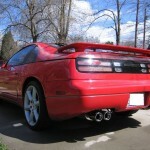 I need to find out what kind of exhaust it currently has. 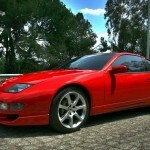 I think it just has single tips on each side which is a look I don’t necessarily like for the Z32. If it is that style of exhaust and it’s obnoxiously loud I’m going to have to move that up to my first priority. I was doing my daily checks on craigslist last night for 300s just in case something better comes along and ran across a Labree exhaust for sale. I had never heard of this brand before so I started checking on it and it was definitely the one with the tips that I like the most. I then did some checking on YouTube for videos of the exhaust to see how it sounded. I ran across videos that gave a good example of it and I thought it sounded pretty nice, I did read through some forums as well though and saw some folks talking about them “droning”. I’m not real sure what that means but I’d guess that it means they are too loud while you are driving the car. Since I plan on driving the car daily for the most part this probably won’t work but they do sound nice. Once I decided those probably wouldn’t work I read in some more forums to try to find out what the quietest exhaust that still gives performance and a little meaner than stock sound. I’m not sure that I’ve found any answers in regard to which exhaust system that is yet so my search continues. I’ve tried to search for a Magnaflow exhaust for the 300ZX but I guess I’m confused because all I can seem to find from them is a catalytic converter. It seems Flowmaster makes one as well and I’ve seen people talking about B&B. 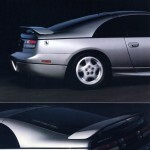 I’m hoping that the exhaust on the one that I buy is to my liking and has a few miles left on it so that I have time to decide because it is very apparent to me that there are many things that I don’t know about when it comes to the available exhaust options for the 300ZX.